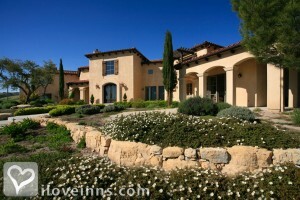 San Luis Obispo bed and breakfast travel guide for romantic, historic and adventure b&b's. Browse through the iLoveInns.com database of San Luis Obispo, California bed and breakfasts and country inns to find detailed listings that include room rates, special deals and area activities. You can click on the 'check rates and availability' button to contact the innkeeper. San Luis Obispo in California's Central Coast is a great place to stay when planning to visit one of California's most famous attractions, Hearst Castle. Lots of great dining at any of the downtown restaurants, a complete night life facilities, shops and arts centers suitable for a university town. Nearby wine country tours are popular as well. Don't skip Fremont Theater which is a historic art deco theater from the 1940s. Almost every visitor to a San Luis Obispo Bed and Breakfast visits the infamous chewing gum wall but there is more to the vibrant college town. Be sure to same time for the Famers Market and the San Luis Obispo Mission and San Luis Obispo Botanical Gardens. There's the Sunset Drive-In Theater for Southern Californians who miss that experience. there are plenty of good restaurants when visiting students at the university including Apple Farm Inn, Granada Bistro and Upper Crust. Bed and breakfast guests keep innkeepers up to date as to the quality of most of the town's dining options. By Heritage Inn - A San Luis Obispo Bed and Breakfast.